Enter the number of guests to confirm availability for your group. If there are no tours available for the selected day, please choose a different day or call 904-404-6177 to speak someone. By far one of the cleanest waterways in Jacksonville, the pristine Julington Creek winds its way west from near I95 south of town to the St. John's River. 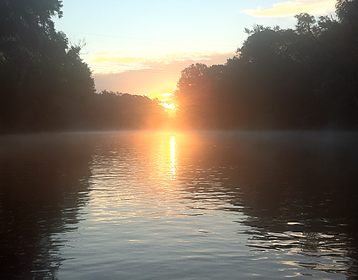 Book your sunrise paddle on Julington Creek today to experience a deer crossing or see a hungry river otter looking for some breakfast. The tree canopy along Julington Creek offers plenty of shade and protection from the wind, making this a great tour for all ages. Note: There is no dry land to stop and stretch your legs on this half-day tour, besides the occasional private boat dock (for emergencies only). Despite that, this is one of our most popular tours. For a longer, more strenuous tour, book a full-day tour of Julington Creek. The full day tour includes a stop at the famous Clark's Fish Camp for lunch, a unique seafood restaurant with stuffed animals and fish covering the walls.